His father wanted to see him in a military ca­reer, and at the age of ten he was sent to the Moscow Cadet Corps. This was the start of years of monotonous and wearisome training. But it was then that the boy’s artistic bent revealed itself. His first essays—portraits of friends and caricatures—proved successful. On finishing the Cadet Corps in 1833, Fedotov was appointed to the household troops of the Finland regiment in St. Petersburg, where he served for ten years (1834-44). Nicholas I’s army was plagued by endless reviews and manoeuvres and a mania for parades. As a distraction from the boredom and monotony, Fedotov read a lot, studied languages, took an interest in music and wrote poetry; but as before his main hobby was paint­ing and drawing. At around this time he started attending evening classes at the Academy of Arts. His pencil brought to life scenes of sense­less, exhausting drills; the themes of his draw­ings and water-colours were military exercises and camp service. The more time and effort Fedotov put into his artistic hobby, the more clearly he realised that he would have to choose between painting and a military career. 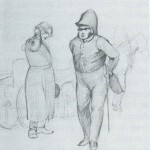 He was forced to give even more thought to the matter by a letter from the well- known fable-writer Ivan Krylov, who, having been impressed by the talent of the young offi­cer, strongly advised him to give up military ser­vice and ‘dedicate yourself to your true calling—the depiction of the life of the people’. Fedotov had already considered going into retirement and now the idea would not leave him in peace. But only someone possessed of great courage and, above all, self-confidence, could renounce a secure position and doom himself to an indigent existence. So Fedotov asked Karl Bryullov, whose fame had spread all over Europe, to give his assessment of his works. Bryullov studied Fedotov’s works and gave the young artist his ‘blessing’. His parting words —‘Keep at it—a firm will, constancy and hard work can get you anywhere’—had a remarkable effect: Fedotov took to his art with redoubled energy, striving to increase his output. But it was still some years before Fedotov retired. On the difficult path of selfless service to art he had to face poverty, privations and loneli­ness. With his faithful batman Korshunov he moved into small, cold rooms on Vasilievsky Is­land in St. Petersburg and began a life dedicated to art, ‘giving myself neither mercy, nor lenien­cy, nor rest!’. Drawings galore! Fedotov drew everywhere —at the market-places, at the trading rows, in government departments and on the street. But these were not the creations of an impartial observer. With every drawing Fedotov com­mented on life, fighting stagnation and bureau­cratism, exposing the morality of Nicholas’s dig­nitaries. His drawings, which resemble quick, light sketches, convey objects and figures with remarkable precision; together, they make up a kind of artist’s diary. The drawing The Embankment of Vasilievsky Island in Winter is marked by the simplicity and trueness to life of its composition, while there is a biting satirical flavour to The District Official, The Chief and His Subordinates, Cold and Shiv­ering People, and How People Sit Down (RUSSIAN MUSEUM, SAINT PETERSBURG). From this multitude of disparate observations which he mounted in albums, Fedotov went on to produce complete works. 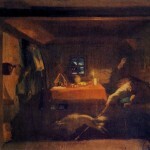 Thus was born the idea for a series of Morally Critical Scenes from Everyday Life, done in sepia: First Morning for a Deceived Young Man; Living at Someone Else’s Expense; Old Age of an Artist Who Married Without a Dowry; Relying on His Talent; Fashion Shop; The Mouse-Trap; Fidelka’s Illness and Death and Christening-Party (1840s, TRETYAKOV GALLERY, MOSCOW). The diverse themes of these drawings, their sharp criticism, their scope and their technical brilliance are all grounds for considering the se­ries one of the most important for the artist’s creative development. But these works are not entirely faultless: they suffer from overcrowded compositions, ‘wordiness’, and an inability to isolate the main point from what is of secondary importance—the action is sometimes so com­plex that the artist, for fear of not being under­stood, supplies the drawings with an explanato­ry text. Yet working on the sepias gave Fedotov a great deal: he gained experience both of life and art and gathered material for new works. In 1847 Fedotov painted The Fastidious Bride (TRETYAKOV GALLERY, MOSCOW), based on Krylov’s fable of the same title. The characters are described with ruthless satire: the old maid, her bridegroom—a fash­ionably dressed hunchback—and the overjoyed parents. The work is a brilliant example of Fedotov’s painting skills. The years of intensive work had not been in vain: the artist had learned to convey the material texture of ob­jects with great virtuosity—from the sheen of mahogany and the rippling of the bride’s silk dress to the gilding on the frames and the soft nap of the carpets. Composition was becoming one of the most important expressive factors in Fedotov’s work, serving to bring out the main idea and con­centrate the attention on the chief protagonists. 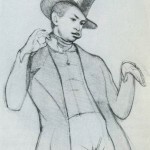 Thus, in The Aristocrat’s Breakfast (1849, TRETYAKOV GALLERY, MOSCOW), the tense pose of the upper-crust fop shown in the centre and the hurried movement of his hands, hiding a slice of bread from the un­expected guest, betray the pettiness and insignificance of this aristocrat who has squan­dered his fortune. When Fedotov showed his pictures to the sick Bryullov, the famous artist was enraptured by them. ‘Congratulations,’ he said, ‘you have out­stripped me.’ Such was his admiration for Fedo­tov as a genre painter. 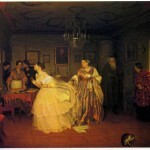 The painting that brought Fedotov wide­spread fame was The Major’s Marriage Pro­posal (1848, Tretyakov Gallery, Moscow). Fedotov’s talent manifested itself with enor­mous power in this painting. Its composition is remarkably lively, natural and simple. The dra­matis personae are closely linked with one another, so that we can almost read a narrative of the life, morals and mores of a merchant family. The figures are characterised parti­cularly aptly by their gestures. In conceiving this picture, Fedotov was guid­ed above all by life. But the main thing was not petty details but the search for the typical and the expressive. The images created by him are the result of thoughtful selection and synthesis of characteristic traits inherent in a particular social type. Fedotov’s works made a huge impression on his contemporaries. They could sense the art­ist’s innovatoriness both in his treatment of quite new themes, in his critical attitude to reality and in his new creative method which al­lowed genre painting to attain the level of so­cially significant art. By the end of the forties Fedotov was an ac­complished master, an artist with an established world-outlook and an individual creative face. He worked at a feverish pace. Ideas for new pic­tures tumbled into his head one after the other, but not all of them were fated to be realised. The final, most difficult period in his life was setting in. It was the middle of Nicholas’s dark reign, with its terror and cruel censorship. Any display of critical thinking led to persecution and prohi­bition… ‘The people could have learned a great deal,’ the artist wrote at that time, ‘but the censorship prevents it.’ Soon the journal Sovremennik (The Contemporary), on which Fedotov collaborated, was closed down. His Morally Critical Scenes were never published. Lithographs of his pictures were banned too. The artist found himself in a hopeless material situation and his family was forced to sell their house to pay debts. Fedotov had renounced a great deal—a mili­tary career, wealth and personal happiness—for the sake of art. He firmly and unhesitatingly stuck to his chosen path, and, despite the hard­ships, he continued to work tirelessly. In the last years of his life Fedotov turned to portrait-painting. His portraits revealed new facets of his talent—a deeply poetical, emo­tional approach to his subject. 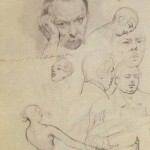 In an effort to unveil the mental states of his subjects, Fedotov usually depicted them in their cus­tomary environment, caught in the middle of some action. This gives his portraits a genre character. 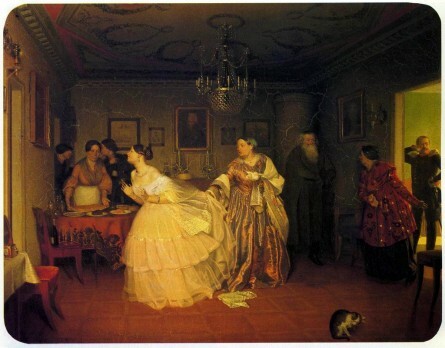 The best of them is that of N. P. Zhdanovich (1849, RUSSIAN MUSEUM, SAINT PETERSBURG). 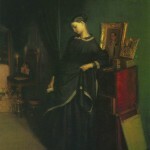 In 1852, one of Fedotov’s first dramatic pic­tures appeared—The Young Widow (Tretyakov Gallery, Moscow). With tremendous empathy, the artist tells of the bitter fate of a woman left without a hus­band and expecting a baby. She stands deep in thought, resting against the sideboard. Her belongings have been sealed up to cover the debts left by her husband. At first glance ly­rical, this painting proves to be as acute and significant as Fedotov’s early canvases. Here too he uncloaked a world of violence and tyranny, where a weak, unprotected person can so easily perish. 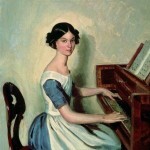 The idea for the painting was suggested by the fate of Fedotov’s widowed sister, who was left with two small children on her hands after her husband’s death. At almost the same time as The Young Wid­ow, Fedotov painted two more magnificent pictures: Encore! Encore! (1850-51, Tretyakov Gallery, Moscow) and The Gamblers (1852, State Museum of Russian Art, Kiev). Both works, in essence, are on the same theme—the spiritual bankruptcy inflicted on Russian life by Nicholas’s regime. Never before had Fedotov achieved such power of social accusation, such sharpness of critical thought. The artist’s manner of painting was now more spirited and sweeping, and colour more important as a factor of lighting. It is the idea behind Encore! Encore! that dictated the pic­ture’s emotional, tense colour range—the com­bination of the reds and browns of the interior and the cold, intense blue square of sky at the little window. This work was the climax of the artist’s creative development, one of the mas­terpieces of Russian realist painting of the nineteenth century. Fedotov’s life ended tragically. He died at thirty-seven in a psychiatric hospital. ‘Fedotov is dead,’ wrote the critic Stasov, ‘ha­ving brought into the world only a tiny grain of the wealth with which his nature was endowed.